Tokyo is one of those places where you won't mind not having an itinerary—you can aimlessly walk around and find so many things to see, do, and eat concentrated in just one area of the city. Every corner is also photogenic AF, which, let's face it, is every millennial's not-so-secret concern. Need proof? 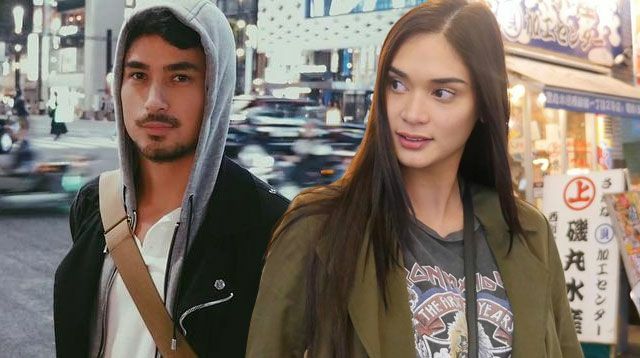 Pia Wurtzbach and Marlon Stockinger are currently vacationing there, and between visiting owl sanctuaries, gorging on delish food, and soaking up the sights, the It couple are posting tons of travel OOTDs on Instagram! No time to waste! Immediately upon arrival, Pia and Marlon made their way around Tokyo's upscale Ginza district to explore and, of course, eat. Queen P opted for comfy attire consisting of a floral shift dress, a cozy cardigan, warm leggings, and pavement-friendly ankle boots. Marlon ain't too shabby, favoring casual urban pieces as a motorcycle jacket, a gray hoodie, and a messenger bag. Food is definitely a highlight for these two. While in Shinjuku, Pia playfully snapped a photo amid the brightly lit restaurants and captioned it, "Gosh the food... di kami naguusap ni Marlon pag kumakain." LOL! We love her off-duty outfit, too: Graphic tees and fringed hemlines are super on-trend, while clean white Gucci Aces are a modern classic. Souvenir jackets are synonymous with edgy Japanese style, so we're not entirely surprised that Marlon brought this bomber with him. It's the perfect piece for a time-lapse video at the bustling Shibuya crossing! On their third day in the city, the two dropped by some of Tokyo's famous (and entirely picturesque) temples. Here, Pia contrasted Meiji Shrine's iconic colorful sake barrels in a white bell-sleeve blouse over a black jumpsuit. Chiiiic! Meanwhile, at Sensoji, Marlon sampled the variety of food in the stalls leading up to the temple, all while looking handsome AF in a crisp button-down. What is it with guys in white shirts with rolled up sleeves that make us swoon?! Pia only gave us a glimpse of her white tee and lace-trimmed slip (or cami), but we can already tell this outfit's good.